One of the least understood secrets behind the success of Berkshire Hathaway and its rise from an $8 stock in the 1960’s to more than $118,000 per share today, is that Warren Buffett focuses on two value “buckets” as he put it in a shareholder letter. The first bucket consists of the operating businesses in which the company holds a controlling stake and the second of marketable securities such as stocks, bonds, mutual funds, et cetera, most of which are held by the insurance subsidiaries such as GEICO, General Re, or National Indemnity, just to name a few. How Does Berkshire Hathaway Work? This arrangement provides several major advantages to Berkshire Hathaway. First, when stocks collapse, Buffett is able to rely on the cash generated by the operating businesses to provide him with funds to redeploy into the market, buying up assets on the cheap. If he were running a mutual fund, this would not be the case and as the value of his holdings fell, Warren would be forced to sell something that was already undervalued to buy something that was even more undervalued. Second, the operating businesses are insulated from daily valuations (except to the extent that the parent holding company is publicly traded), giving it a much more stable net worth an estimated private market value than a mutual fund would have. Thus, banks are more likely to loan on a long-term, fixed-rate basis to a stable business with real assets such as factories, retail stores, computers, and such that they would be on a ​portfolio of stocks representing shares of those same companies. 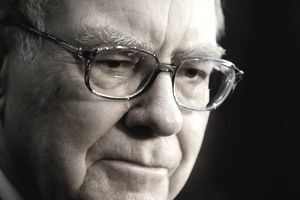 In your own life, you are likely to find that it is considerably easier to raise your net worth quickly when focusing on both of these, taking the same “double barrel” approach Buffett and his long-time business partner, Munger, have made a cornerstone of their empire. For most people, their primary “operating business” would be their day job. Whether you are a teacher, firefighter, accountant, or part-time babysitter, it is this stream of funds that allows you to pay your bills, watch television, buy groceries, and put gas in your car. It is also this income that provides you with your first real capital to acquire investments. Just like any good business, you want to grow your profits, or in this case salary, wages, and other income from the job, as much as possible with the smallest investment. Thus, if your choices are working more hours to make more money or going back to school to become a doctor, you might opt for the latter due to the much higher earnings down the road by putting in a comparable amount of double and triple-shifts. This leads to a golden rule of wealth building: You must invest in yourself if you want to experience true financial freedom. This means gaining new skills and turning those skills into monetary gain. Only a few days ago, I read a story in a newspaper about a homemaker that has gotten so good at coupon clipping, she can cut a $150 grocery bill down to $40 – keep in mind, that since food is bought with after-tax income, these results are exponentially more impressive than they may appear. The reality is that those with specialized skills such as heart surgeons, auto mechanics, dentists, plumbers, and fluent speakers of Mandarin Chinese are not being left out of the global economy. Virtually all of us have the potential to add some of these unique skill sets to our vocational toolbox, but the notion that you are going to be able to graduate from high school with nothing more than a diploma, get a job for life, and retire well is naïve. The genie is out of the bottle in the world of globalization and nothing could reverse that (even if the U.S. were to enact massive trade protections, we would experience horrific recession or depression and China and India would eclipse us at an even faster pace). Once you have your primary career on track and are investing in your own skills, it might be time to acquire or establish other operating businesses. For some, this could mean building storage units or car washes. For others, it might include starting a lawn mowing service. One member of my family has a career as a flight attendant, production manager at an embroidery company, and then owns a diaper cake design business on the side. She lives off her salary as a manager, using the other two jobs mostly as pure investment capital to ensure that she has millions of dollars in wealth by her forties despite having an average income and supporting a family. This is where you really have an opportunity to generate cash doing something you love. When adding these other operating businesses, you should strive to find things that make you “tap dance” to work, to borrow a phrase from Buffett. Let’s say you are 25 years old and manage to sell paintings or perform magic at birthday parties and weddings, generating an extra $96 per week (roughly $5,000 per year). That might not seem like a lot but it’s going to add up to $9,266,500+ by the time you are Warren Buffett’s age if you park it in a Roth IRA and manage to generate the historical 11% rate of return the S&P has brought in for its owners over the long-haul. As you generate cash, you are going to want to have it invested in the most tax-efficient manner possible. That means taking advantage of your 401k, and an individual retirement account such as a Traditional IRA, Roth IRA, or SEP-IRA just to name a few. Here, if wisely and prudently invested, those funds can blossom into a torrent of capital gains, dividends, and interest, all of which is plowed back in to generate even more profits. If the stock market falls, you can take advantage of your operating businesses to dollar cost average your positions, thus taking advantage of the basic principles of value investing.